The mangled bogies of the EMU (electric multiple unit) shuttle train that collided head on with an express train near village Baghola in Palwal district of Haryana, about 80 km from New Delhi on Dec 8, 2015. Nearly 100 people were injured in the accident. 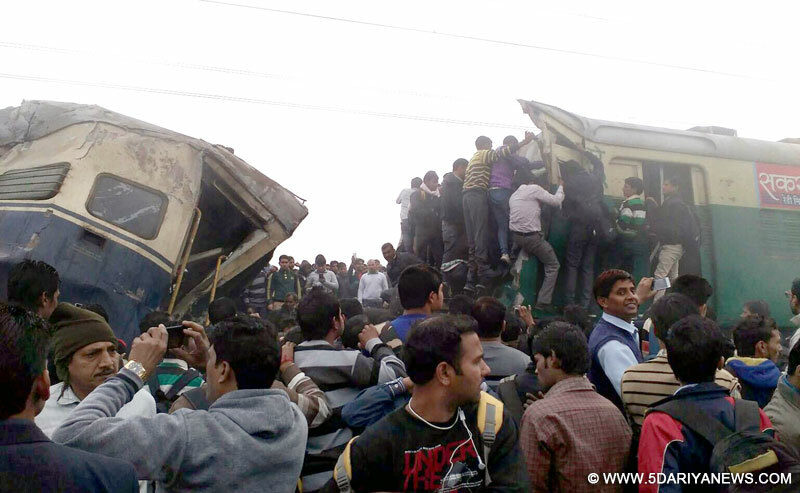 The driver of a local train was killed and several others were injured when the EMU shuttle train rammed into a stationary train from behind in Haryana's Palwal district on Tuesday morning in foggy conditions, police officials said.The accident took place near village Baghola in Palwal district, about 60 km from New Delhi, when the EMU (electric multiple unit) shuttle train rammed into the Lokmanya Tilak-Haridwar Express that had halted on the same track since it did not get a signal to move forward.Dense fog was said to be the reason behind the accident.Northern Railway spokesman Neeraj Sharma confirmed the death of the EMU shuttle train's driver. Eyewitnesses alleged that rescue teams arrived late at the spot and did not even have gas cutters and other equipment to help bring out the trapped passengers. They alleged that the EMU driver was alive after the mishap but died since he could not be evacuated immediately.Railway authorities said they were trying to restore traffic on the route.Haryana Chief Minister Manohar Lal Khattar spoke to Palwal deputy commissioner and asked him to step up rescue and relief work. Was Mi17 chopper shot down by own defence system?